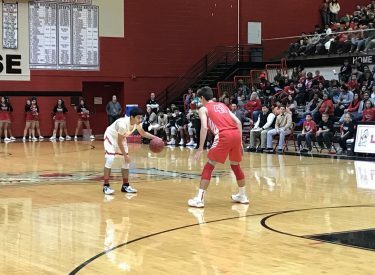 The Liberal Redskins are 5-1 at Christmas break after a 47-32 win over the Perryton Rangers in front of a big crowd in the Big House Friday night. The first half contained drastic swings of momentum. The Redskins bolted out to a 15-2 lead in front of the big home crowd buoyed by a Southern Pioneer buyout. However, the Rangers owned the second quarter out pacing LHS 17-4 to send the game to halftime tied at 19-19. The Redskins led 34-26 at the end of three and overcame two technical fouls against Redskin players to extend their lead in the fourth quarter. Jordan Mendoza led Liberal with 19 points. Brody Sumner added nine. Syris Dunlap spearheaded a defensive onslaught against Perryton’s Griffon Brosowske who averages 25 a game and scored eight. The Redskins were 7-19 from three point range and 7-12 at the foul line. Perryton was 5-14 and 4-6 from the charity stripe. Liberal is 5-1 and Perryton is 4-3. The Redskins play January 4 against the Hays Indians at 7:45 on 1270 and kscbnews.net.